Hina is debuting in Bollywood with a film in which she is playing the character of a Kashmiri girl. After Divyanka Tripathi, Hina Khan became the target of fashion police Diet Sabya who criticised her for copying an international label. Not only this, but Diet Sabya has also accused her for wearing the same outfit as international singer Bebe Rexha. 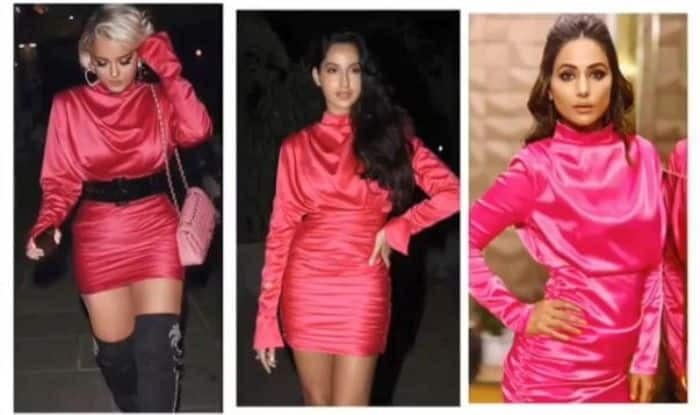 Hina donned the pink dress at Dabboo Ratnani’s calendar launch 2019 and have received flak for it. Now instead of being silent about the entire fiasco, she decided to come out and give a befitting reply to her accusers. Earlier today, she took to Instagram live along with her boyfriend Rocky Jaiswal and said that she wasn’t offended but was amused by all the reactions. The Kasautii Zindagii actress also said that people should be careful before commenting on the pages that have a blue tick. Rocky also came to her defence and said that if an international celebrity wears a saree, she will be inspired by Indian designer and that doesn’t mean she copies it. Hina trolled her accusers that if her fans get inspired by her look and they even wear it, then they are copying her. Well, her reply was bang on and we can’t agree with her more. On the work front, Hina is debuting in Bollywood with a film in which she is playing the character of a Kashmiri girl. Veteran actor Farida Jalal will also be playing an important role in the film. For her comeback on TV after Bigg Boss, the actor chose to appear as Komolika, the famous vamp, on Kasautii Zindagii Kay. However, the current track hasn’t really been able to grip the audience.